gradability (in 1st AND Rev), with 2 passengers, and with 5.
ability of the handbrake in such situations to hold the vehicle. approach, departure, and breakover angles. And (very important) effectiveness of the AC. This stickering seem to be only present in the demo / test vehicles. It is not there in the actual cars that are being sold. Probably would be available as an accessory later. The only visible differentiation is the 4WD badging at the rear. It is not there in my RXZ AWD. I have one question for you though: I remember reading that you need a flatbed for towing AWD/4WD vehicles, and especially when in lock position. Does this apply to the Duster as well? 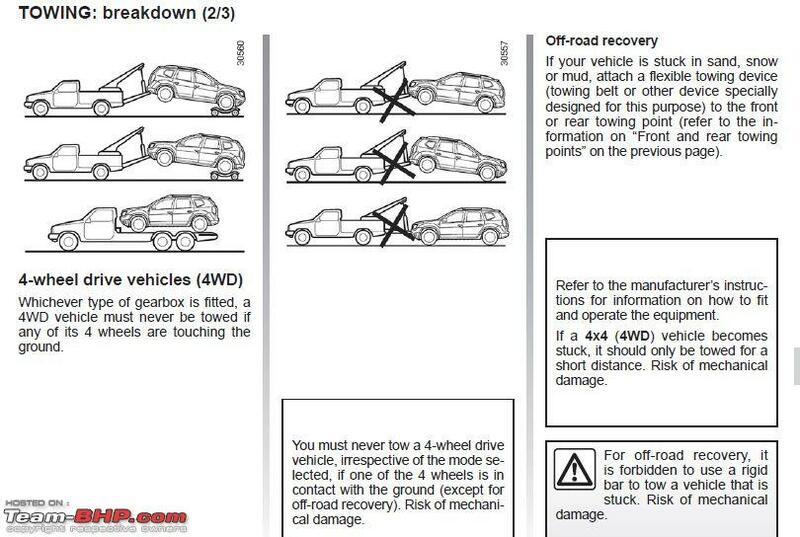 Also, the nissan x-trail's manual clearly states that in case you cannot arrange for a flat bed pick up, you need to tow the car from behind. Assuming that the duster AWD shares the same system, can you kindly confirm this in the manual? If the above is true, can I request you kindly add this point somewhere? This is correct , it is in the manual , please see the snapshot below. 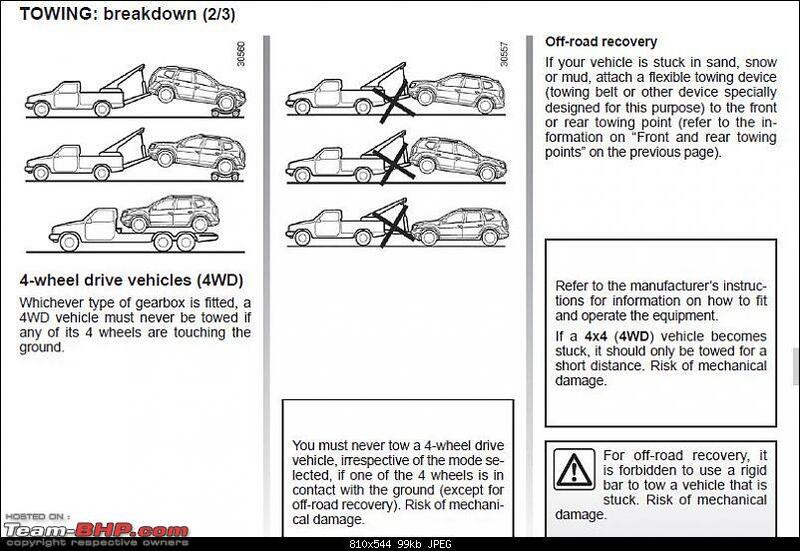 Here is a link to a US Dacia Duster Owners Manual , pretty much identical with my own manual. Great review but may be the off-road bit could've been explored a little more. I mean how & where exactly the demo vehicle maxed out would have been something to really read about. Shouldn't the Storme 4x4 price be listed against its "Top" variant? Is it just me or there are fellow bhpians who think 4wd variant would have looked better in Adventure style body kit? Sure it will make the AWD a good looking SUV with some extra muscle. Only part that might come in way of off roading are the foot steps. Otherwise RENAULT should consider it seriously for a 15-16 lakh on road priced car or make it an option!! 12.9 lacs exshowroom in delhi I guess would translate to about 16 lacs on road in a city like bangalore. This looks really over priced for what it offers. Yeah. Trident Renault site lists the AWD RxL variant at Rs. 14.84 lakhs and the AWD RxZ variant at Rs. 16.21 lakhs, both on-road Bangalore. The top-end does look a tad over-priced. The duster has unmatched ride quality and it's build quality is also a notch above the other 4WD's compared here. But the price it commands for this seems to be on the higher side. (The Scorpio 4WD offers more goodies at a much lesser price) Anyways, 4-wheel drives aren't everyone's cup of tea and the Duster doesn't intend to be one either. In short, the 4WD has strengthened the already strong Duster Lineup. Nice review. Rated five stars. The AWD feels like one of those cars that is getting there - almost there. It has all the right elements, but is missing just a crucial few. Add some niceties and creature comforts and Renault has a winning formula on their hands. Bring in an Auto and Renault gets to be the segment God! Reviews cant get better than this, Rated full five stars! I guess this would be the ideal vehicle for people who occassionally go offroad. Wish it would cost a little less. XUV W8 is I guess 2 lakhs more on road in Karnataka and would tempt buyers. Even for those who may never go offroad,wouldnt all those safety kit be beneficial? So, slight body lift, taller AT/MT tyres and a performance box/remap..............Game-Set-Match!!! Poor NVH as compared to even 2WD is not digestible given the price. Look at Hyundai, they are segment leaders in NVH. Did the noise change w.r.t road surface on stock tyres ? Am not sure i agree with this point. Even in the "what you wont like" section..its mentioned that NVH is poor. Am not sure if it was because of copy paste job from previews reviews. I for one found the nvh to be great compared to my Punto and swift. I could hardly hear the engine clatter and wind noise at 100kmph in the test drive vehicle. I thought the engine refinement was great and all the extra door beadings helped in containing nvh and wind noice. Please note i test drove the vehicle for not more than 20kms and i could be wrong. Others who have test driven the vehicle can give their perspective. A superb comprehensive review by Rehaan & Tejas, a big thanks. I feel Renault could increase sales of their 2WDs variants by adding the better ergonomics of this AWD to those variants. The instrument cluster with 3 dial meters is a big big change. The change in gear ratios and torque/power curve is another. For many Indians looking to change from a sedan to this 'crossover with magic ride' able to handle all our bad roads, potholes, dirt road unfinished segments, unexpected speed breakers unruffled, the 2WD by itself makes more sense. The Duster is just made for our roads. Just out of curiosity I recently took a casual test drive of the 2WD duster and now I am truly hooked !! Hope Renault upgrade the 2WD twins soon and give us better 'car like interiors' . They already have a winner in their hands with this low noise diesel engine with much less drone and clatter when compared to the fiat or VW diesels. I for one dislike taking my Octavia on unknown country roads fearing unexpected potholes & speed breakers.........the Duster will handle all this with aplomb !! Last edited by rxpaul : 18th October 2014 at 23:15. Old model, but most specs are similar. Handbrake : Very effective. But I did not use it. Hill start works well in forward and reverse. AC : The 2WD has good AC. So I guess this should also be fine? But can do more if you are careful. Renault could have introduced the facelifted version for the AWD, and then followed it up in the 2wd also. And for a vehicle costing 15 lakhs, automatic aircon, leather seats, should have been standard in my opinion. As thilak29 has pointed out, the Adventure trim makes sense in the AWD, atleast in the top variant. The 2wd Dusters would be much better with the improvements to the interiors such as soft touch dash, new instrument cluster, steering wheel, etc. Last edited by P76 : 19th October 2014 at 13:59.